It doesn’t seem like a tough direction, given Rawitz’s winning smile and halo of dark curls. As he stands center stage, the other cast members slide into their places while the rehearsal piano plunks the first notes of “Pirelli’s Miracle Elixir,” one of the lighthearted numbers amid the Sturm und Drang of the darkly comic musical thriller Sweeney Todd (which just opened at Drury Lane Oakbrook). 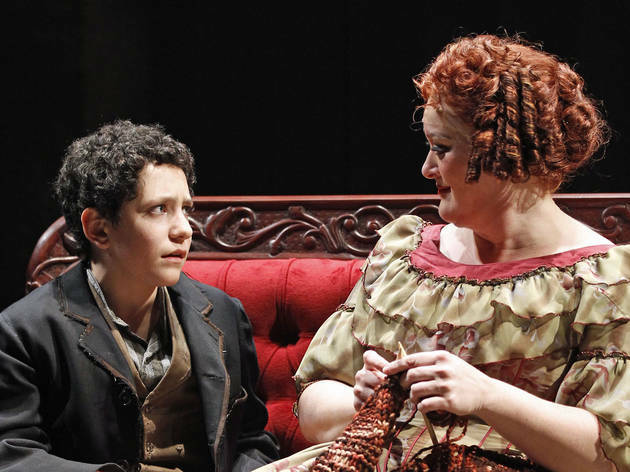 On cue, Rawitz sings, bangs a drum and holds court as Tobias Ragg, the young apprentice peddling a sham elixir on the streets of mid-1800s London. And when we say young, we mean it: Rawitz is just 13. In the bloody world of this cautionary tale, the actor portraying Toby must embody a precious innocence amid vengeful tragedy. (If you’ve never seen the musical, we won’t spoil it—but the show’s subtitle is The Demon Barber of Fleet Street.) Typically played by a short tenor in his twenties, the Toby of the original Broadway cast was a simpleton with a limp—a facile choice for engaging audience sympathy. Rockwell had a different vision: What if Toby were actually a boy? 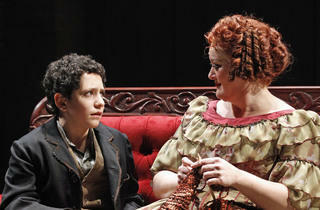 Sweeney Todd slashes audience expectations at Drury Lane Oakbrook through October 9.